At last, I can officially share some exciting news! The first IkeaHackers book is on sale NOW and my Children’s Ikea Hack Cabin Bed features in it. 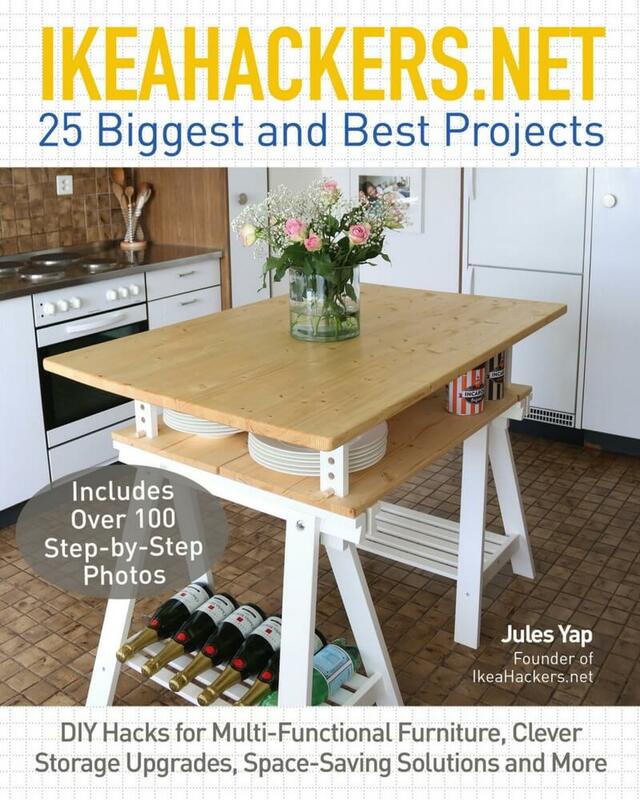 The book, by Jules Yap, the founder of the wildly successful IkeaHackers.net website, contains 25 of the biggest and best projects, including Sofia Clara’s brilliant kitchen island, featured on the front cover. Whilst some of the ingenious designs have already been published on the Ikeahackers website, the book also contains a number of several never-seen-before hacks and exclusive projects co-designed by Jules Yap. What is an Ikea Hack? Put simply, an Ikea Hack involves thinking outside the Ikea flat pack box and repurposing Ikea products to create useful and stylish furnishings for your home. Ikea Hacks range from something as simple as adding embellishments, to more radical adaptations and modifications requiring power tools and lots of imagination and creativity. IkeaHackers.net was founded by Jules Yap (not her real name) in 2006. 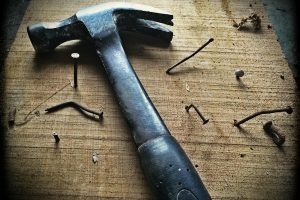 After searching for Ikea Hacks online, Jules discovered hundreds of fantastic DIY projects where Ikea items had been modified or repurposed. 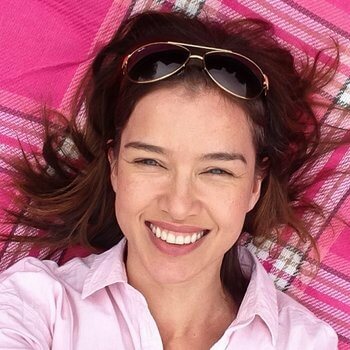 She decided to set up a website where people could submit details of their clever hacks, including step-by-step instructions and photos, for publication. 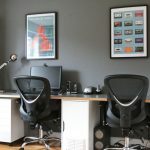 From humble beginnings as a ‘blogspot’ blog, IkeaHackers.net grew into the wildly popular website we have today, filled with thousands of clever Ikea hacks from contributors all over the globe. 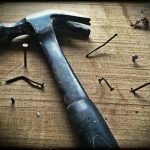 Contrary to popular belief, IkeaHackers.net is purely a fan-run site and is neither endorsed by nor supported by Ikea. However, I suspect the ‘big wigs’ at Ikea Head Office are absolutely delighted by the publicity and sales the IkeaHackers.net website generates for their brand. What’s inside the first official IkeaHackers book? Inside the IkeaHackers book you’ll find 25 different projects from 19 contributors, including my very own Children’s cabin bed Ikea hack (with secret den). 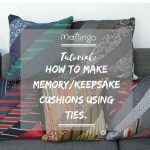 There are hacks for the living room, including TV and media units, a sofa table and room divider. For the bedroom you’ll find two headboard hacks and a dressing table. There are also a couple of impressive kitchen hacks too, including the kitchen island featured on the front cover of the book and a designer bar cart. Every project in the book comes with step-by-step instructions, as well as full-colour illustrations and photographs. Plus, there are 7 exclusive projects in the book, co-created by Jules Yap. 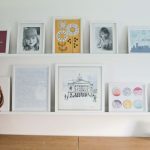 My bedroom makeover is featured in the IkeaHackers book! As one of the contributors to the IkeaHackers book, I’ve known about it for some time. 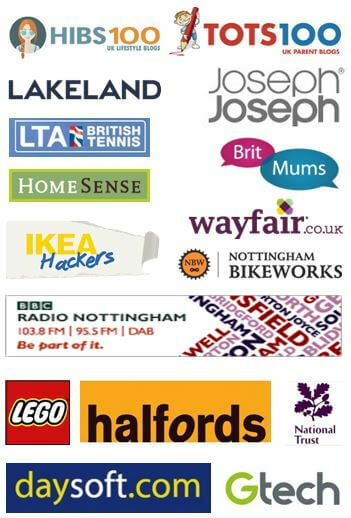 Jules first contacted me about it back in May 2016 after I’d submitted my Ikea Hack, the Children’s Cabin Bed with Secret den to IkeaHackers.net for publication. I didn’t hear anything for a month and assumed my hack had been rejected until I received an email from Jules. She explained she liked my cabin bed Ikea hack so much that she wanted to include it in her forthcoming book. Naturally, I was absolutely delighted to be asked and readily agreed. 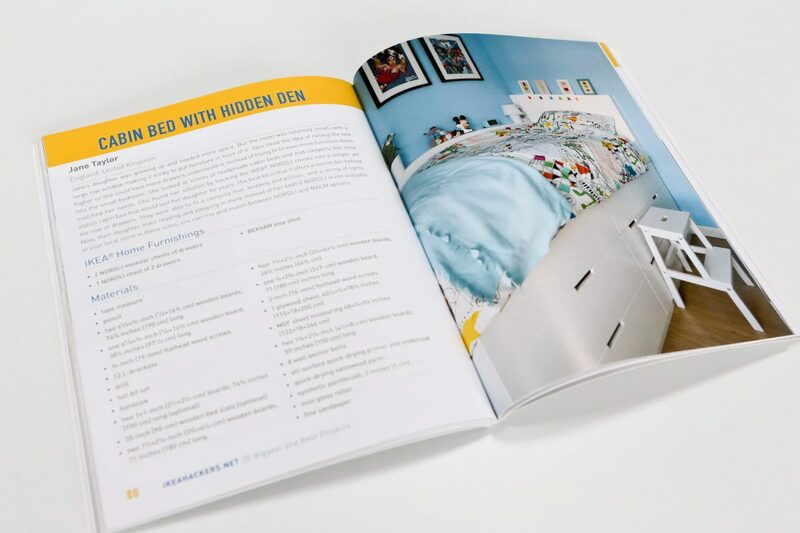 15 months later and my Children’s Ikea Hack Cabin Bed with secret den is in print, along with 24 other inspirational projects. I’ll admit, I hadn’t anticipated how much work would be involved in getting my step-by-step tutorial up to scratch for the publishers. There were lots of edits and revisions and I must have measured that blimin’ bed hundreds of times. 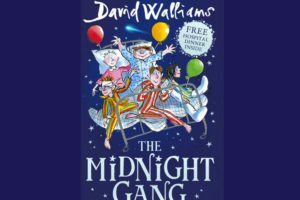 However, it was worth it and it makes me appreciate how much work Jules and the rest of the team must have put into collating, creating and publishing the book. 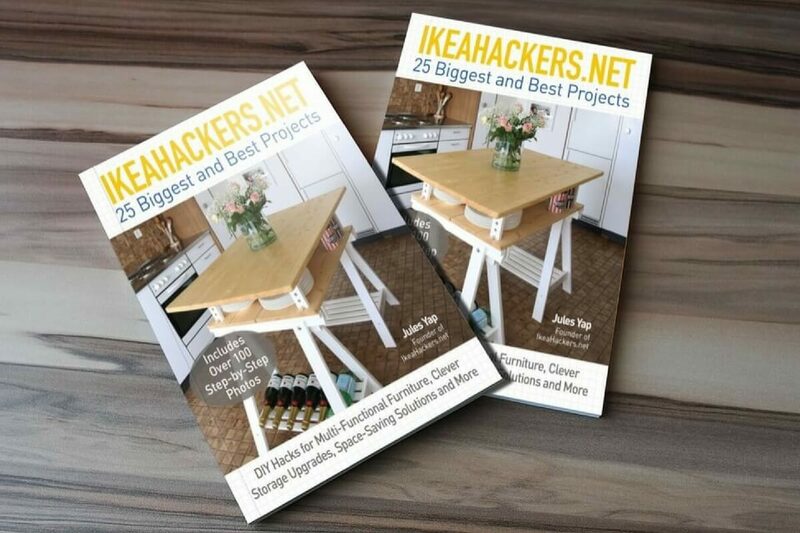 Book Review: IkeaHackers.net 25 biggest and best projects. I didn’t know what to expect when I unwrapped the package containing the IkeaHackers.net book. I’d seen a mock-up of the front cover, I’d supplied photographs, expanded step-by-step instructions, diagrams and countless revisions of my own project but the rest of the book was a mystery to me. So what’s the verdict? I love it! There are some wonderfully creative DIY projects in the book. These unique and ingenious DIY projects are sure to inspire you to have a go at repurposing Ikea items for your home. The book is chock-full of photographs and there’s an introduction to each hack and a bio of each contributor, too. I was so nervous when it came to reading my own contribution, but, on the whole, I’m pleased with how it’s all turned out. As a bonafide perfectionist, I do have one niggle with the final result: The publishers wanted to include Imperial measurements as well as my original metric measurements in the book. However, for some inexplicable reason, the metric measurements I submitted have been expressed as fractions. Hopefully, it won’t cause any confusion. Where can you buy the IkeaHackers book? Win a copy of the IkeaHackers.net book worth £12.99. 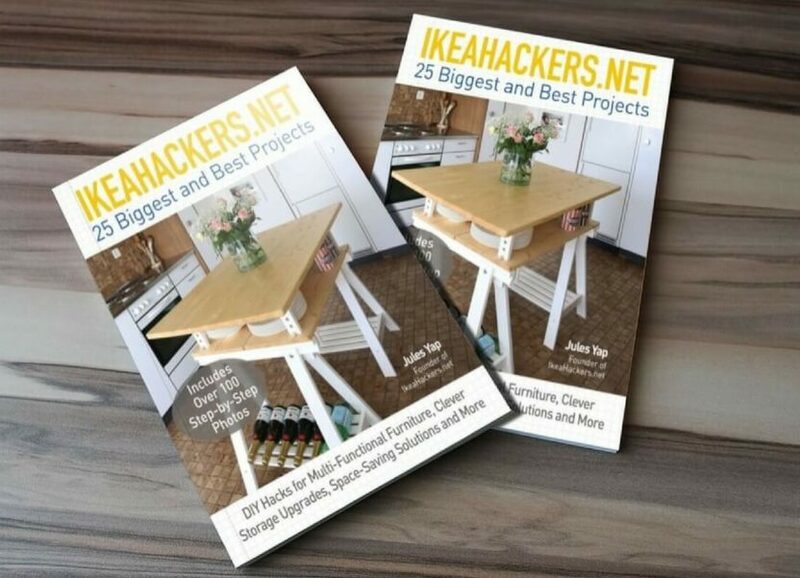 The lovely folks at Penguin Random House UK are offering one of my readers the chance to win a copy of Jules Yap’s fantastic book: IkeaHackers.net 25 Biggest and Best Projects worth £12.99. 1. 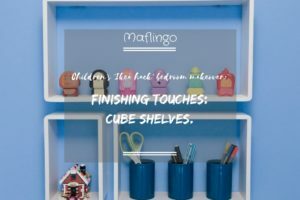 There is one IkeaHackers.net book available for one winner. 7. Entries must be received by 11.59pm on 27th August 2017. 8. The winners will be chosen at random and notified by email on 28th August 2017. Are you a fan of Ikea? Have you visited the IkeaHackers website to find some inspiration or have you invented your own Ikea Hack or life hack? As always, I’d love to hear from you. For even more fabulous IkeaHacks to inspire and amaze you, visit: IkeaHackers.net. Penguin Random House provided me with a copy of ‘IkeaHackers.net: 25 biggest and best projects’ for the purposes of this review. As always, the views and opinions expressed here are my own honest assessment. This is fab, well done Jane! That’s brilliant! Cheaper than buying a strawberry huller. Vinegar for effective cleaning of surfaces. My favourite Ikea hack so far has been using the spice racks for a book corner in our toy room. Great idea! Make that squeezed & zested lemon go even further and use it to freshen up your kitchen appliances. Place half a used lemon in the top basket of your dishwasher when running a normal load for sparkly dishes, a cleaner appliance & it smells great too! The other (juicer) half can be used to clean & deodorise a microwave! Take a microwave proof bowl or jug, 3/4 fill it with water, cut the 1/2 lemon into 4 pieces and add to the bowl. Heat on high for 3 minutes, then leave for another 3 minutes so the steam can work off any grime. It should just require a quick wipe out with a cloth or kitchen paper to make it sparkly clean & will smell amazing! use unscented dental floss to to perfectly cut through cake, cheese and other soft foods ! What a great tip! Love it! Definitely vinegar for cleaning of surfaces. OFLORA FROM HOME AND BARGAINS FOR CLEANING! A little olive oil dabbed on a cloth and then wiped over any stainless steel surfaces makes them brilliantly shiny. Use your washing powder as a general cleaner. It really cuts through dirt, grime and grease, very good on shower trays, baths and sinks. Put some down the loo and watch the stains disappear, no need for other high priced cleaners. Use a Doc Leaf to rid of your nettle stings. Dry used orange and lemon peel then grate it into a powder and sprinkle in areas that are likely entry points for spiders…it works brilliantly as an insect repellent. Getting my son to do the jobs I hate lol!!!! Use baby wipes for cleaning hard to reach nooks and crannies! I’ve been eyeing your bed up for ages – just waiting for my little boy to be old enough for it! Go for it! You could make the den supercool for a boy – like a proper camoflaged hideout or something! You must get in touch with pictures if you do have a go! I had to put a board under the mattress as the slats kept slipping out. Wow – you made it to the top 25, that’s awesome! But then, so is the bed – especially the secret compartment. At work I always keep my pen in my hair (when it is up) so I don’t lose it! I use lemon vinegar and bicarb of soda around the house as cheap eco friendly cleaners. Using vinegar and lemon juice to clean everything! Use vinegar for cleaning windows! Wooden pallets for free from local businesses .. great for making things for around the home and garden. So far have made two garden gates, spice shelves for the kitchen, planters and coldframes. For cleaning: keep your windows open while you do it if you can. It makes you feel so much less bogged down by it all. You can use spice racks in so many ways! Use or upcycle an old magnetic knife holder to display metal toys or tools such as drill bits. A drop of zoflora wiped on the radiator to scent the room gently!